"What are you kids doing with my best blanket?" "We're, um... watching for whales, Mum!" Name of town has been changed. Herd of zebras glimpsed in the Kara Sea. Well, actually some very strongly barred cloud formations which seem to have been subjected to a very regular large-scale shearing of air masses after the ribbons of cloud formed. Any other knowledge/ideas on this? Both images from Worldview, unaltered. The second image is for the regional context. Thanks. I looked them up. Fascinating! Like air in a wind instrument, only gravity-assisted. Quiz time: where is this? I love watching the ice pour through this strait. In this image it looks like a child's face in profile at lower left, blowing frosty breath in the cold winter air. I am hoping to find a live feed from a webcam located out on the sea ice. It seems like the ones I can check on the webcam page aren't working this year. I can see the Barrow/Utqiagvik & Summit Camp ones are live. But I was hoping to include a sea ice one to be running on a screen beside a art piece about sea ice loss I am making for an exhibition that will be on show from August til early November so I thought would capture the max period of ice decline. There are quite a few webcams around the arctic, but unfortunately none on the sea ice itself, and most webcams are in relatively southern locations with no sea ice. Here's a web page with most of these webcams. Thanks Oren, yes I had checked there too. All sorts of v interesting cams but not quite what I think would work. You might want to take a look at http://obuoy.datatransport.org/ . There where no replacements deployed, so the last footage is from 2017 (obuoy 14). Select an 'OBuoy' on the upper left and then 'Movie' at the bottom. Phytoplankton in ther Chukchi Sea. i remember great images from thunderstorms and lightnings which many found great to look at, even though i'm sure that the ship crews or house owners below those clouds or that got hit by lightnings were not so happy or found it great. Thanks to pikaia & gerontocrat. That's pretty compelling visual proof we are changing the chemistry of the planet. I saw a time lapsed animation of annual algal blooms in the Gulf of Mexico that really demonstrated how much damage these things cause. "How global warming is causing ocean oxygen levels to fall"
Winter has returned to mountains near Eureka, Ellesmere island. Not sure of the elevation but you can see the sea. Maybe 400m? The Barrow webcam images yesterday showed the breakup of the offshore grounded ice. 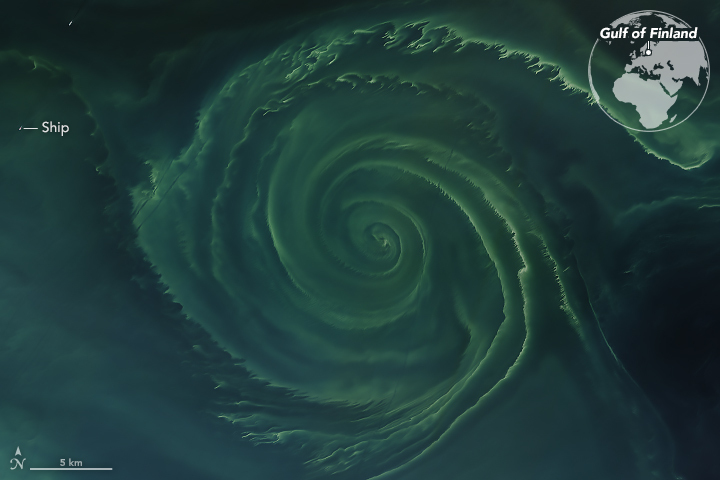 This phytoplankton bloom is in the Baltic. Very pretty but not a hopeful sign of things now and to come. Recent paper ofn the subject. It is us wot dunnit. ecosystems and biogeochemical cycles throughout the world. Another "off topic" ... Here is a 'sketch' of Antarctica's Larsen Deer via today's PolarView: suitable for cave art, if you ask me! Perusing around Worldview, noted a few lakes still frozen on Quebec’s Ungava Peninsula. Some smaller lakes within the borders of Pingualuit National Park and a larger lake (named ?) a bit south of there. I checked Worldview images 2000-2017 and this appears to be latest date into the summer that the larger lake still mostly ice covered. Quite a lot of fog in Barrow Strait today. It finishes at Griffith Island (alt 130m), near Resolute - see below. See Worldview. Worth following back down the Strait for more wonderful effects. I made this a few years ago. 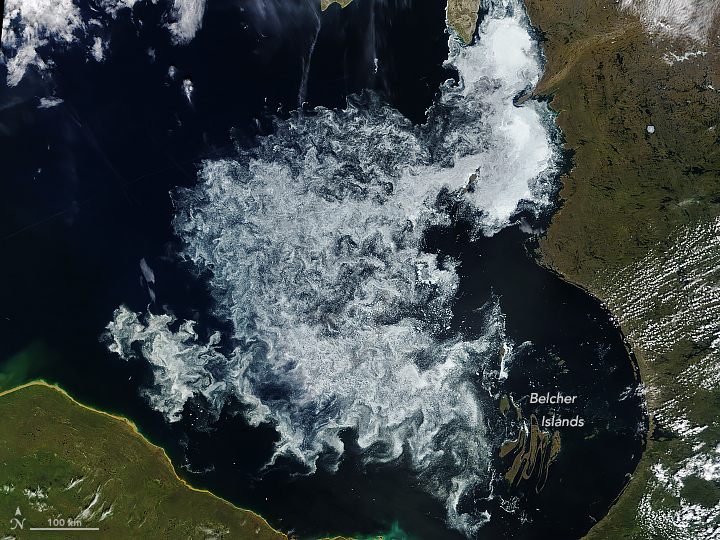 The video shows drifting sea ice around Hopen. Alas images in link are gone. Somewhere I read this "hair" is a result of decomposing muscle fibers. Well that certainly seems notable. Was that the last remnant of the N. American ice sheet of the last glaciation? If so, seems some memorial should be organized. Maybe there's another intact fragment somewhere. Obviously, not my area of expertise. Regardless, thanks for pointing out the development. Like air in a wind instrument, only gravity-assisted. After diligent decades of work, oboist Heinz Holliger extracted wondrously beautiful performances of baroque concertos for the notoriously difficult-to-play oboe. Later, he dabbled in archaic modern music. One album he rendered, must have been a compilation (with emphasis on the word pile) of the ugliest sounds he ever produced from the oboe. The album made you feel you were in a large tunnel, dripping with spit (& other offal) produced by a giant ugly oger, playing a woodwind instrument(the tunnel). Never could I play the album, without getting sick & I had to stop the album. The album missed its calling & WASN'T used in any of the Lord of the Rings movies, depicting giants, trolls, orcs & ogres playing dirges to the Lord Sauron. Obliterated may be a better description. Looks like a small portion, maybe 20% of what had remained of the shelf, is still hanging on. comparing the recent image with this one from 2008 shows the ice which is called "Ward Hunt iceshelf" by the canadian government undisintegrated. 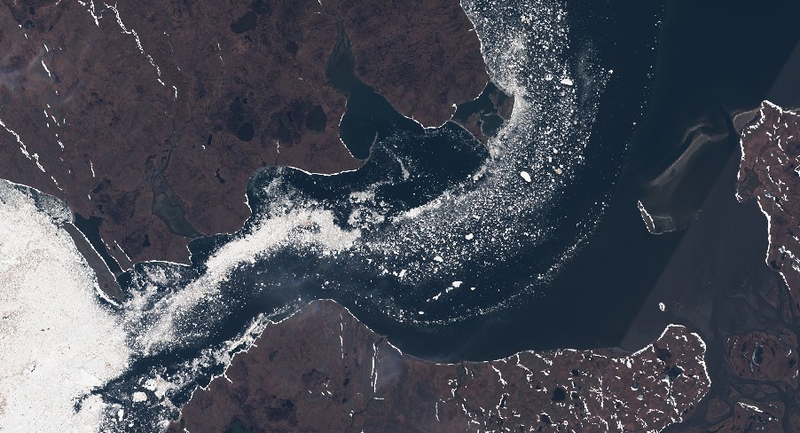 Can you point out where you see an "obliterated ice shelf"? These claims are just plain wrong. You just post some recent satellite picture and then claim - without indicating any uncertainty and without presenting any evidence - that an ice shelf has collapsed "in the last few days". But nobody of you seems to care, if that claim is actually true. Comparing that region with previous years like 2012 shows, that the ice shelf (or at least that what you believe the ice shelf is) is now not smaller than in 2012 but actually bigger. So first of all, there is no indication from your pictures that anything has "collapsed" there and the overall state of the ice in 2012 was in a much worse shape than this year. And second of all, it is nearly impossible to tell the difference between thick fast ice and the actual ice shelf on those satellite pictures to begin with. I really don't know, why you make those claims in the first place, when you have no idea if they are true or if you don't care if they are true, but I do. The state of the Arctic is bad enough. There is really no need to fabricate stories like that and it does a disservice IMO to those people, that care about our planet and that really want to know, what is happening and where we are headed. We don't need a WUWT just in the opposite direction. I read that forum for the last few years because I was used to get factually correct information from here. But if you have to verify for each post, if the claims or "facts" presented are actually true, than I have no reason to waste my time here distinguishing between actual facts and fake news. A claim deconstructed! I must admit that I never could see any "collapse" from the posted images, but then again, I had trouble seeing what those images were supposed to be showing. I apologize for whatever degree my comment, made too hastily, may have contributed to the error. ..... But nobody of you seems to care, if that claim is actually true. It is a often thankless chore to bother with fact checking and contradicting false, I think mostly erroneous claims on this forum. But unless someone does it, you can't (sadly I agree) rely on correct information on this forum. The claims of disintegrating ice shelfs come up everytime sea ice breaks off the north coast of Ellesmere. Diablobanquisa's questioning was at least a pointer to this being a dubious claim, Jim showed an image of an ice shelf which certainly was not disintegrated (without explaining what part is old ice, it is the stuff which has ridges parallel to the coast) and I did provide information which I hoped refuted the claim of "obliteration"
I think the "peer review process" on this forum worked reasonably well. But each of those mentioned put in an effort and spent time they could have spent on something else. I personally feel encouraged to do this by your comment, deconstruct, because I agree that this forum should be better than other ones, but you could have worded it in a more constructive way, if i may say. No need to apologize to me! You made a mistake. We all make mistakes all of the time. This issue was blown up way beyond what it should have been. I very much like your posts jdallen. Please don't let this cause you to stop posting. I don't know why people took things so personal. I totally understand how you made an off hand comment based upon the satellite images. I thought the exact same thing when I saw those images. In any event, I posted this in the hope that the negative comments don't cause you to stop posting. Just blow off the assholes who feel the need to attack people for any little mistake. There are lots of other people on this forum who appreciate your contributions. I think you have been unfairly attacked over this issue. You can count me in this group. JD is one of the strongest contributors here. If I can get through a whole week without making a whoops on one of my posts it is a minor miracle. They usually are spotted and I fix them. The people who spot them do not see any reason to make a hoo-hah about it,and nor do I. And anyway, now I know a lot more about the Arctic ice-shelf remnants. I made the original observation, based on a very clear image, I have been observing this shelf regularly for some 10 years. No I can’t go out and walk on it to verify. But still looks to me that it is in some sort of disintegrating shape. Certainly worst I have seen, time will tell if bits float away. But never intended as fake news or anything similar. It was intended to make people aware and get discussion going, for if this is the case it’s a very significant even. It does need the observation and experience to come to a balance of judgement from an esteemed group like this. But still looks to me that it is in some sort of disintegrating shape. 1) That is not what you said in your post. Not even close. You said the ice shelf was "obliterated". 2) What does that even mean? Either you see some clear cracks indicating a disintegration of the ice shelf or you dont. I don't want anyone to stop posting. But if someone posts a claim, and also a very clear and bold one, than I would expect that that person also has substantial evidence. If I just want to post a picture, I can do so without making bold claims that I can't support. If I am unsure about what the image shows or don't shows, I can express that. But as a reader I can't look inside the head of the post's author. All I can see are the words that were written. So it matters, how you phrase things and what words you use for how that information is perceived by the reader. So I just would ask people, to be more careful when claiming things and think a minute about that claim, and if there is good reason and/or demonstrable evidence to support it. And there is no reason, to make unsupported claims to rise awareness for the Arctic or Global Warming in general. The Arctic is already in such a bad shape, that there is already every reason to be worried. And if someone is not alarmed by the current developments in the Arctic, he will not be persuaded anyway.